I find that I cook almost as much on the day before Thanksgiving as I do on the the big day itself. With two solid days of cooking, I'm usually ready for ordering in pizza or going out to eat when Friday rolls around. When all the guests have left and you realize that no matter how much you ate on Thanksgiving, somehow everyone still needs dinner the next day, that is when this easy skillet recipe comes into play. Simple to make, delicious to taste, this skillet dish is a leftover makeover at its best. 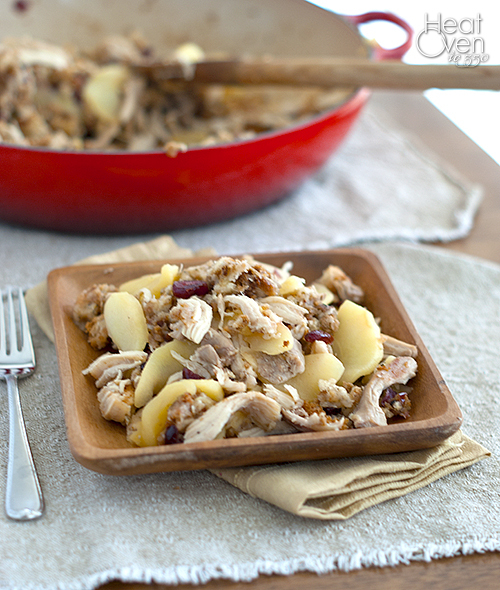 Apples, cranberries, stuffing and turkey combine in a single dish that tastes like the best of Thanksgiving. It uses up some leftover turkey, which is a bonus, and includes stuffing, which in my book makes it awesome because I'm always trying to figure out ways to justify a giant bowl of stuffing as a meal. If you want a fast, easy meal that is delicious and will still give you a chance to put your feet up at the end of the day, this is it. In a large skillet over medium heat, combine apples, juice, broth, butter, cranberries and nutmeg. Bring to a boil, reduce heat and cover. Simmer for 4-5 minutes or until apples are tender, stirring occasionally. 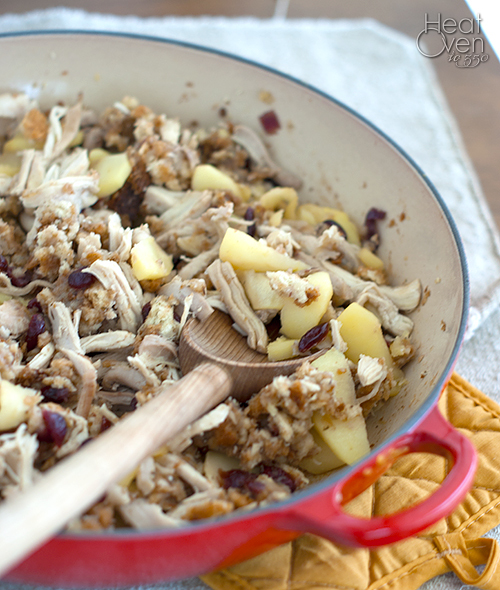 Stir in turkey and stuffing mix. Cover and cook 2-3 minutes or until heated through. Cookies were a hit at Thanksgiving all of our guest loved them. So I shared the recipe with them. Thanks for sharing such a wonderful cookie recipe. What a great idea for left overs. I'm totally leftovered out at this point..but I will be pinning for next year! What a great combo of all the leftovers! Sounds delicious, especially with those apples. Hope you had a great Thanksgiving, Nicole!! That looks delicious! I love sweet with meat, and I scored THREE bags of cranberries off the dollar rack that are in my freezer. Glad you had a nice Thanksgiving! been looking for cheesecake recipes, this one sounds really good. Any more with cream cheese... please send me them!!! Can you freeze the cookie dough? Or freeze the baked cookies? I've never tried to do either. :( I would think the baked cookies would freeze better than the dough, but I am not sure how well it would work. Let me know if you try and how it comes out. I used to bake a similar version of these years ago but lost the recipe. Thank you so much for this! One stick of butter is 1/2 a cup. So 2 1/2 sticks is 1 1/4 cups. Hope this helps! Thank you so much. Great recipe.